DEBALTSEVE, Ukraine -- The latest peace plan never had much chance. Shortly after signing it in Minsk, rebel leaders declared that Debaltseve, where several thousand Ukrainian troops were located, fell outside its terms. The fall of Debaltseve underlines the cynicism of the Minsk ceasefire. After the “ceasefire” started on February 15th, they continued their assault. By February 18th the flag of Novorossiya, the rebels’ pseudo-state, had been raised over the city centre. “It’s always tough to lose,” quipped Russia’s president, Vladimir Putin. Ukraine’s president, Petro Poroshenko, ordered a risky retreat and tried to paint the defeat as a victory, saying his troops’ swift escape had put Russia “to shame”. Such spin fell on deaf ears inside Ukraine. Photos of muddied troops who had fled on foot belied claims of an “organised” operation. Soldiers told of a night-time journey across frozen fields, punctuated by ambushes and casualties. The Ukrainian government claims regular Russian troops backed the rebels. Douglas Lute, America’s ambassador to NATO, says that teams of specialised Russians, mostly Spetsnaz elite troops, are operating command-and-control systems and the most sophisticated weapons. These troops form “a sort of parallel command structure answerable to Moscow,” he says. Mr Poroshenko claimed 80% of his forces in Debaltseve had already got out, and that only six men were killed in the retreat. Reports from the ground put the number higher. The morgue director in Artemovsk says he took in 13 bodies on the day of the retreat. The fall of Debaltseve was not evidence of Russian superiority, says Semyon Semyonchenko, a battalion commander, but of the Ukrainian army leaders’ “gross incompetence”. 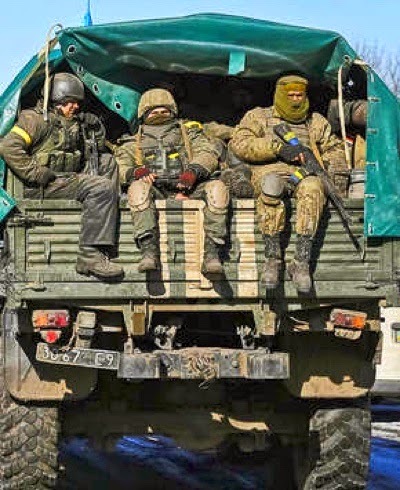 Despite being surrounded on three sides since last autumn, Ukrainian troops were ordered to remain in Debaltseve. An offensive to straighten out the lines could have derailed the peace talks. For Kiev, a retreat risked a popular backlash. Ultimately, the decision to try to hold the territory was political, says one Ukrainian official. The loss of Debaltseve will be a blow to Mr Poroshenko, but not a fatal one. Even his detractors see that internal turmoil in Ukraine plays into Russia’s hands. And Mr Poroshenko has earned respect for his handling of international diplomacy. Many see the president’s men, not the president, as the main problem. “You are a Patriot with a capital letter,” wrote Borys Filatov, an oft-critical parliamentarian. He urged Mr Poroshenko to let “decent people” into his circle instead of “sycophants and despots”. As a concession to his critics, Mr Poroshenko may sacrifice the chief of the general staff, Viktor Muzhenko, who has faced withering opprobrium. The president could also impose martial law, a step he has threatened publicly. That would trigger full-scale mobilisation and allow the government to grab private property for military use and to clamp down on press freedom. But it would not produce more tanks or fix the economy. The latest fighting has spooked markets, driving bond prices and the hryvnia to record lows. A new IMF loan may prove inadequate in the face of continued fighting. The hardest dilemma may be for the West, which has to decide how to respond to Putin’s renewed aggression. Western leaders spoke again to the Russian president on February 18th, after Debaltseve’s fall, without making headway. Germany called the Minsk peace plan “damaged” but not yet dead. Kiev proposed an international peacekeeping force, an idea Moscow swiftly rejected. The rebels said they were now ready to pull back their heavy weapons. But even if the ceasefire is salvaged, it is a far cry from lasting peace. And Novorossiya’s backers still have designs on Mariupol and Kharkiv.